52. I broke a pair of pants. The first time I put them on. Last year, I bought my very first pair of white jeans. I got them on sale at Old Navy, and they were the last pair in my size. It was like the heavens parted, and God shouted, “Buy them, my child!” I’m not about to argue with a deity, so I did. Without trying them on. It turns out that Old Navy’s Rockstar jeans run a LOT smaller than their other styles. I did buy a few sizes up because of this, but the jeans were still a teensy bit snug when I tried them on at home. The zipper is also fairly short due to the rise of the pants, so as I was pulling them on…the zipper completely broke. I did actually wear them once with the broken zipper; I just wore a tunic-length tank underneath to cover up my blunder. I think I should be able to do this on my own, as long as I take my time. I might have to purchase a zipper foot, but I’m fairly certain one came with my machine. We’ll see how this project turns out. The only alterations I’ve done are hemming a few pairs of jeans. If this goes well, I’ll have to try my hand at altering some of my thrift store finds. 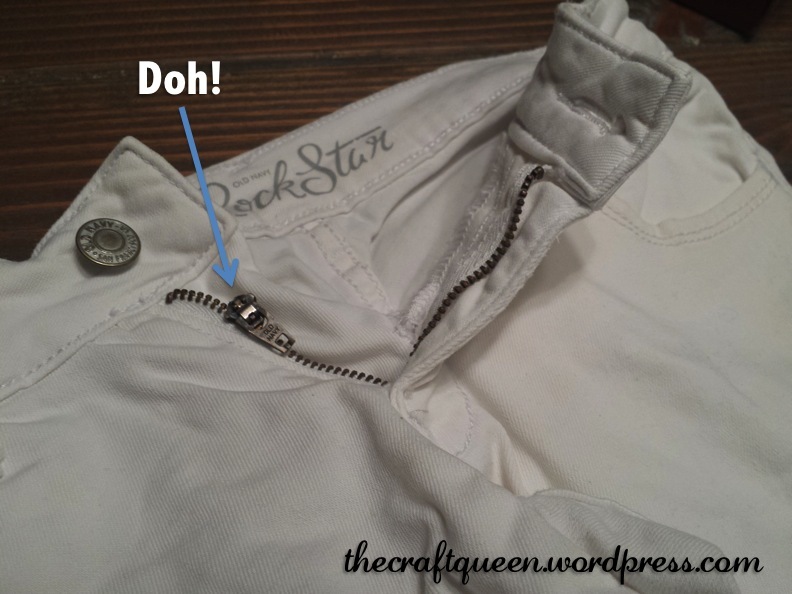 This entry was posted in Uncategorized and tagged broken zipper, diy, fix, how to. Bookmark the permalink. ← 51. Knitting: Sweater update and sneak peak at a new pattern! You’ll definitely want a zipper foot. It’s almost impossible to run a zipper under a regular one–the stitching gets all crooked and ugly. But don’t worry, zippers are actually really easy! Once you sew your first one (which will probably be a little confusing, admittedly), you don’t forget how. You’ll want to sew a zipper to everything. Thanks! I ended up doing exactly that. The zipper works again, but unfortunately the pants are now too tight! Such is life, I guess!